The name Lapis Lazuli is composed of the Latin word for stone, “lapis”, and “lazuli”, a derivation of the Persian “Lāzhvard”, the name of the place where lapis lazuli was historically mined. Interestingly, “lazuli” shares the same root as the Spanish and Portuguese “azul”, the French “azur” and the English “azure”, all words for the colour blue. This suggests that lapis lazuli has played an historical role in influencing these languages. 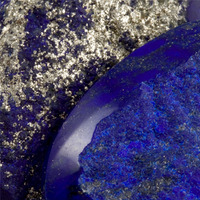 Lapis lazuli, or lapis for short, is technically a rock – a composition of more than one mineral. It occurs in crystalline marble through contact metamorphism. The main constituents of lapis are lazurite, sodalite, calcite and pyrite, but other minerals may be present. Lazurite, (Na,Ca)8(AlSiO4)6(SO4,S,Cl)2, is the main constituent, making up between 25% to 40% of the mix. It is a feldspathoid mineral – a low silica igneous (volcanic) mineral that would have formed a feldspar if more silica were present. It is the sulfur content of the lazurite that is primarily responsible for the blue colour of lapis. Sodalite, (Na4Al3(SiO4)3Cl), which is closely related to lazurite, is also usually present. The other minerals often found in lapis are white Calcite, CaCO3, and pyrite, FeS2. Other minerals that may be found include diopside, hornblende, noselite, hauynite, augite, mica and enstatite. The finest examples of lapis lazuli display an intense, deep blue colour, described as “ultramarine”. A fine sprinkling of golden coloured pyrite inclusions against this rich blue background gives the impression of stars in a clear night sky. When calcite is present, the stone will display streaks or blotchy grains of white. Generally, the presence of calcite will lower the value of the stone, whilst stones of a uniform rich blue with pyrite inclusions are highly prized. It is not unknown for lower quality lapis to be dyed. The effect is usually a very dark blue colour, as opposed to the vivid blue of higher quality, natural lapis. The lapis lazuli deposits of Badakhshan province in Afghanistan have been mined for over 6000 years, and remain active to this day. Lapis was amongst the first of the gemstones to be worked and worn as jewellery, in the history of civilization. Indeed, the ancient Mesopotamian city of Ur was considered a trading hub for lapis since the fourth millennium B.C. From the Indian subcontinent through to Central Asia, Persia, Egypt, the Mediterranean coast and Northern Africa, lapis has been found amongst ancient relics and monuments in the form of carvings, amulets, jewellery, signet rings, vessels, vases and decorative mosaics. In ancient times, lapis was referred to as sapphire, and it is believed that references in biblical writings to sapphire are actually referring to lapis lazuli. The breastplate worn by the Jewish high priest included lapis amongst its 12 special stones. It is said that King Solomon wore a ring of lapis that helped him to control demons. Carved beads of lapis have been found in countless Neolithic burial sites. The women of ancient Egypt used powdered lapis as eyeshadow. India’s Taj Mahal is adorned with an elaborate mosaic of coloured stones, including lapis. The Romans considered it an aphrodesiac, and in the Middle Ages it was ground, mixed with milk and applied to ulcers and boils. Since the 6th Century A.D, lapis was ground into a powder to make the artists’ pigment, “ultramarine”. During the Renaissance, ultramarine was extensively used for the depiction of the Virgin Mary’s and Christ’s robes, and was more expensive than gold. It was not until the 19th Century that synthetic ultramarine was produced. To this day, though, lapis-based ultramarine is still used by some artists, and art restorers. 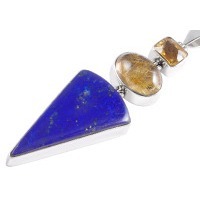 Lapis Lazuli is known as the stone of awareness and self-knowledge. It helps one to be true to oneself, identify the patterns and beliefs that have prevented ones spiritual development and make the adjustments to break free from those patterns and embrace ones true nature. This is also a stone of initiation into the higher and subtler realms of the mind. It helps one to access information about past lives and alternative realities, a concept well understood by the ancient Egyptians. It can be used to access sacred knowledge, to enhance intuitiveness and to encourage the development of ones psychic abilities. 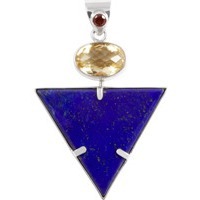 It is said to resonate well with those who have a past life connection with ancient Egypt, or other cultures that recognized the esoteric value of lapis. At the highest level, self-knowledge translates into a connection with the Divine principle, and the receipt of Divine guidance. Lapis Lazuli activates the throat chakra, inspiring one to communicate the truth. It sharpens intellect and memory, making it an excellent ally in study and learning. 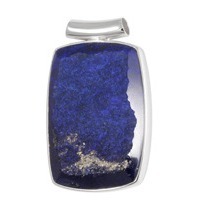 Lapis creates clarity of thought and encourages better organization in ones daily life. It is said that lapis helps to relieve stress, overcome depression and cultivate peace of mind and wellbeing. It balances ones yin and yang and may also restore harmony to relationships. 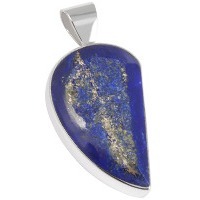 Lapis is attributed with treating throat, thyroid and bone marrow conditions. It is also suggested for treatment of the immune system, insomnia and dizziness. It is recommended to be carried or worn during recovery from surgery. 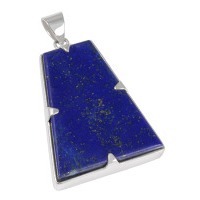 Lapis Lazuli relates to the astrological sign of Sagittarius, and vibrates to the number 3. *Note that Lapis Lazuli should always be protected from acidic substances.